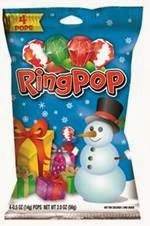 Shakin & Bakin Foodie Blog: Ring Pop Holiday Candy Giveaway! Ring Pop Holiday Candy Giveaway! The holidays are coming and every where you go you are starting to see holiday decorations, gift ideas, holiday food and all kinds of holiday related items. Well, this year I am determined to be completely done with my holiday shopping and that includes shopping for stocking stuffers! When considering all of your options for those stocking stuffers for kids...make sure you don't forget a few packs of holiday candy. Kids love that kind of stuff and there is nothing wrong with giving them a few candy treats around the holidays as long as its in moderation. Ring Pops have been around for a long time and I can remember having them as a child myself. Then over the years when I became a mother I ended up purchasing them for my own daughter. Now that I am a grandmother to a precious 4 year old, I am purchasing them again! The holiday-themed Ring Pop Pack features four different flavors Watermelon, Strawberry, and Christmas Cherry Swirl. The candy will be sold at Walmart, Target and Dollar Tree for $1 per pack. Which flavor is your favorite? For me, I am all over that watermelon for sure! Ring Pop is sponsoring a giveaway here on the Shakin N Bakin Foodie Blog! One lucky winner will win 2 packs of holiday-themed Ring Pops! Enter below and good luck! Giveaway Details: This giveaway is open to residents of the USA ONLY who are age 18 and over. Please read the Terms of Service and Disclaimer Policy before entering. You must be a PUBLIC FOLLOWER of this Blog to have your entries count in my giveaways. (Follow via Google Friend Connect) All non-blog followers will have their entries disqualified after the giveaway closes. This giveaway will close on December 1st, 2013 at midnight EST time. One of my favorite stocking stuffers is the Life Saver Book. My mom always put it in our stockings when we were kids, and so I like to put it in my daughters' stockings. My favorite stocking stuffer is gift cards, small amounts, like lunches. I always like putting lip balms in stockings. I entered the Wisconsin Cheeseman giveaway at TTC. I follow via GFC (Jennifer Tilson). I entered the Energizer Home Safety kit giveaway at TTC. I love to give Clementines in my kids stockings. We call them little Christmas oranges. It's a family tradition!! I entered the Old El Paso giveaway at TTC. I like to put candy, small toys, and hair bows in their stockings. I entered the My Boxercraft giveaway at TTC. I entered the Build-A-Bear giveaway at TTC. I like toe give chocolate! Stephen A added as a friend! I entered the Hips & Curves giveaway at TTC. I entered the Omax3 giveaway. As a kid the butter rum life saver in the mini book. Now I love the bath shower gels. I've entered every contest at TCC! I entered the TCC LED Christmas Lights from YardOutlet.com giveaway. I'v entered the Energizer Home Safety kit giveaway at TTC and most all of the others too! I think the chocolate santa is a mandatory stocking stuffer. I entered the TCC 48" LED Lit Holiday Christmas Wreath giveaway. I've entered all the TCC giveaways everyday! I always liked the lifesaver book. I entered the Hongar Farms Benissimo Flavored Oils giveaway at TTC. I entered the Energizer Home Safety kit giveaway at the other site. I entered the Kristian Regale Giveaway. My favorite stocking stuffer to receive is the chocolate truffles my husband always gets me. I entered the Hongar Farms Benissimo Flavored Oil giveaway on TCC. Hongar Farms Benissimo Flavored Oils giveaway on TTC. - entered! No matter what each stocking always has a large orange and apple. I follow via GFC as Tara Carlson. I entered the Rejuvenator Showerhead With Microbubble Technology giveaway on Two Classy Chic's blog. Meagan Liani ~ GFC Follower! Meagan M. Greenan Liani ~ Facebook Friend Request sent!